Diving Tubbataha Reef: A Quick Guide – a concise rundown of what to expect at Tubbataha and the practicalities of getting there and planning your trip. The Remote Nature of Tubbataha is Priceless to Visitors. Tubbataha is two atolls in the middle of the Sulu Sea. Because of its’ remoteness, there are no run offs from other land sources or land masses. Therefore there is always spectacular visibility for divers to enjoy. Tubbataha is an overnight sail from the nearest city, Puerta Princesa and depending on the speed of your boat and the weather conditions, it usually takes between 12 and 15 hours to reach Tubbataha. Getting there requires crossing large areas of open sea with no real shelter. The dive sites in Tubbataha are only open to divers for three months of the year, between late March and the middle of June, which is considered Philippine summer. Tubbataha Designated a UNESCO World Heritage Site. Because of its location, Tubbataha has been designated a UNESCO world heritage site, which is unique for a diving destination. It is the only World Heritage site in Asia that is marine in nature. The government and the divers take pride in the fact that it is a world heritage site. The rangers and the park managers are very active in attending UNESCO meetings and seminars, and want to make sure that they are keeping up to date with what is going on. It’s protection has encouraged other areas such as Mount Hamigitan, which is one of the southern provinces in the Philippines, to apply to be declared a World Heritage site as well. Variety of Marine Life Making Tubbataha The Disney Land of Diving. Life is very dynamic around the Tubbatuah reef. There is so much variety in the marine life, including whale sharks, tiger sharks, grey reef sharks, bumpheads, barracuda, manta rays, and everything all at once. Nothing stays in one place for a very long time. Every time you go for a dive, you cannot be sure what you’re going to get, like you would expect in some places. Divers relate Tubbataha to Africa; it is unknown, you never know what to expect. It can be a completely still, boring dive for 30 minutes, and then all of a sudden you get to a point where a lot of current comes in and then you see everything all at once. Often times you do not even know what you’ve see until it is already passed you. Divers have moments like that in Tubbataha all the time. Giant, Refrigerator Sized Barrel Sponges Characteristic of Tubbataha. In many areas of Tubbataha there are large macro fauna to be seen by divers. In the deeper areas, left untouched, and undisturbed, sea fans have been able to grow and grow and obviously grow upon the old corals that die off. They will usually be found in deeper rather than shallower water. The deeper portions hide the biggest sea fans in the area. Another popular site are the giant barrel sponges. If you see a giant barrel sponge bigger than a refrigerator, you know you’re in Tubbataha. The Giant Barrel Sponges are just like sponges, they are attached to the reef surface and are unable to move. Like most sponges, this species has a glass-like skeleton. To date, the Jessie Beazley Reef has the highest live coral cover of anywhere in the Philippines. Divers are getting fields of intact foliose corals, table corals perched at the edge of the reefs, as well as hammerheads, tiger sharks, and whale sharks. The reef is located a third of the way back to Puerta Princesa, and is well known for it’s drop off slopes. The currents can be unpredictable and fast-changing, leading to a lot of variety in marine life. Divers can spot different types of sharks, other bigger fish, including manta rays, groupers, barracudas, and mackerel. Several of the smaller species found on the reef include frogfish, trumphetfish, clownfish, countless bright and colorful nudibranches, and much more. 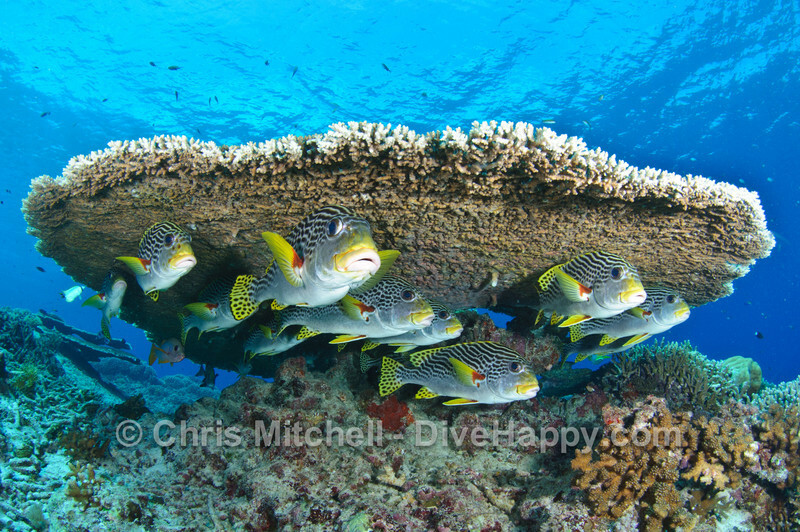 It is a great spot for underwater photography, as visibility is exceptional. Education is Paramount for the Conservation of Marine Life. With the influx of tourists and divers from all over the world, one of the most important aspects of marine conservation is education. The responsibility lies with the dive guides and management to educate new comers on the appropriate behaviours and protection concerns of these precious underwater habitats. Every diver is an environmentalist whether they know it or not, and it is important to take it very seriously to do something proactive about it. We cannot simply assume that once divers graduate with their sea card, they should know already everything there is to know about the do’s and don’ts of marine conservation. If you direct people towards the right things to do, they would generally follow the rules. But you just have to be explicit about what they are. [0:00:06.0] CM: Hello and welcome to Dive Happy, the podcast about the best places to go scuba diving in Asia. I’m your host Chris Mitchel and my guest for this episode is Yvette Lee, Director of marketing and media phase for Discovery Fleet and Dive Vasco. Yvette has been one of the key figures in promoting diving in the Philippines over the last two decades. Hi Yvette, welcome to the show. [0:00:27.7] YM: Thank you Chris. You’re making me sound so old. [0:00:31.9] CM: Venerable, I think is the phrase we’re looking for. So, Yvette, we’ve both been to Tubbataha but can you start by telling our listeners where exactly is it? [0:00:43.4] YM: Okay, Tubbataha is two atolls in the middle of the Sulu Sea. I think you remember that when you arrive in the area, there’s hardly anything breaking the surface. Because of its’ remoteness, there is really no run off from either land sources or land masses. That’s why you have this spectacular visibility that it has always enjoyed. [0:01:06.1] CM: Right. So yes, that’s one thing for start but it’s very remote, isn’t it? I think an overnight sail from the nearest city? [0:01:13.7] YM: From Puerta Princesa. [0:01:15.3] CM: Right, that’s about 12 hours steam? Something like that? [0:01:18.6] YM: Depending on the speed of your boat, it’s usually between 12 to 15 hours. Also the weather conditions, of course. [0:01:28.2] YM: You are crossing a large amount of ocean with no shelter, it’s only open sea. [0:01:34.7] CM: Right, yeah. It’s the definition of the middle of nowhere? [0:01:39.2] YM: There you go. [0:01:41.7] CM: The other thing about it, though — which is because of its location — it’s been designated a UNESCO world heritage site, which I believe is unique for a diving destination? [0:01:51.7] YM: It is the only world Heritage site that is marine in nature in Asia. [0:01:57.6] CM: Wow, and can you remember what year that was given? [0:02:02.1] YM: I’m not sure but I look it up and I’ll get back to you. [0:02:06.1] CM: Okay, has that had an impact though in actually helping to protect the reef and making sure that the government devote time and resources towards looking after it? [0:02:16.0] YM: Yes, because it is a world heritage site by UNESCO, what has happened was there’s a very distinct example that I can give you, there’s a Mount Hamigitan, which is known for its pigmy forest in Davao, which is one of the southern provinces in the Philippines and because they knew about Tubbataha being a world heritage site and how much it has contributed to its protection and also to its claim to fame of course, they also initiated the steps to have their mountain declared a world heritage site. It was included in the short list. I think it’s going to get that status very soon. So yes, the government and of course the divers take pride in the fact that it is a world heritage site and also the rangers and the park managers are very aware of these things. They’re very active in attending UNESCO sets up meetings and seminars, they’re very keen on attending and keeping up to date with what’s going on. [0:03:14.1] CM: Excellent. So yes, there’s sort of an active management going there and you mentioned the rangers, and they have one of the hardest jobs I think anywhere, in that they lived on a tiny little shelter that’s perched on the age of part of Tubbataha reef, don’t they? [0:04:15.7] CM: I bet they were gratefully received. [0:04:16.7] YM: Yes, they were. I don’t know what happened to it though. I think because of the humidity, everybody took a turn at it. [0:04:25.7] CM: Yeah, you say it’s a hardship post and that’s the other thing is as well as Tubbataha being so remote, it’s only actually open to divers for three months of the year right? [0:04:37.5] YM: Correct. That’s from late March to the middle of June which is actually considered our Philippine summer which is spring in the western hemisphere but its’ summer for us here in the Philippines, that’s the time when the weather is driest, the seas are ?at, and there’s very little wind. Most of the time you have glassy conditions in Tubbataha. [0:04:59.3] CM: The rangers though, they’re there all year, right? They’re not just there for those three months. [0:05:03.2] YM: Oh yeah, they’re there 24/7. They spend Christmas and new year and whatever else, during the typhoon, out there in the middle of nowhere. [0:05:10.5] CM: Wow, that is quite remarkable. [0:05:12.6] YM: I have to tell you, Chris, of one privilege that they do have which nobody else have. [0:05:18.5] YM: Which is, they’re the only people allowed to fish because they have to do that to supplement their food source. There’s no refrigeration, there’s no electricity, so aside from rice and canned goods and they try to start a small garden but as they said, one little leaf pokes out and it gets harvested right away because they really want the vegetable. So when the boats are out there during the season, we try to give them ice and vegetables. I mean, the office sends them that, the Tubbataha management office. But when the season is over, whatever they can fish from the sea and whatever canned goods they have. [0:05:58.0] CM: Right. Yes, those poor guys trying to build a garden and like you said it got almost nowhere to walk except for when it hits low tide? What they’re protecting, it’s quite hard to believe given you can’t see anything on the surface or you know, a tiny amount in surface because when you go under the water, it’s effectively like diving on a mountain isn’t it? [0:06:18.3] YM: Yes, the atoll rises from 600 meters to the bottom in certain places and even more. So you’re diving on a speck of land, around the speck of land that’s, you know, you have five fingers, you’re talking about half the size of the smallest pinky nail slipping out from underneath. [0:06:42.6] CM: The reefs have remained in very good condition on the atolls? Do you think they’re surviving the warming of the oceans okay, or do you see changes happening? [0:06:51.6] YM: We’ve had I think, not this year but last year, we started to seeing some of the coral bleaching but the good part about where Tubbataha is because it is in very deep water, we do get cold water upwelling’s. It survived the warmth but when you’re talking about the oceans rising, we are trying to get a new ranger station built because the old one, we’re not sure if it’s because the water is rising or because the base is sinking. But now when there’s high tide and the waves are extraordinarily high, they told me that the water actually enters the floor or covers the floor of the station. [0:07:31.2] YM: Yeah, we’re going to actually get a new ranger station built. Much higher and hopefully with more modern facilities, including accommodations for scientist so that they can stay and study the reef year round ,instead of only during the three month window that we have. [0:07:47.8] CM: Right, for the scientists, is there particular aspects that they’re interest near the reef that’s unique to it or is it just? Because it’s such a huge reef area that it’s a smorgasbord for them? [0:07:58.6] YM: It is both, it’s a smorgasbord for them and I think the management office has gotten a lot busier the last few years because there’s so many request for research to be done. I mean, now they even have — we’ve had the turtle research and the elasmobranch research about the sharks and race for the long time. Now, and also the birds of course, but now there is request to do Napoleon Ras Research and all this other stuff that are coming up. Of course, everybody wants to see because everybody, the divers know what it looks like during the summer, the three months but what does it look like and who comes around as far as the big fauna goes during the non-summer months? Do we get a lot more wood commercial quality schools of fish because during the summer months, of course we have schools of fusiliers, but I think when there’s more plankton in the water, there might be even more schools there. Nobody can really account for it. [0:08:56.1] CM: Right. Obviously you’ve dived at the reef far more than I have but the three or four times I’ve been out there, I get this sense that it’s such a big area and like you were just saying earlier about the cold upwellings and so forth, that life is very dynamic around that reef. It’s not like anything really hangs out for a very long time in one place. So every time you jump in it’s kind of like you’re really not sure what you’re going to get. It’s not like you can jump in a particular dive site and you’re guaranteed to see X thing like you are in some places. Would you say that’s fair or? morning and if you want to see the barracuda’s, they know where to take you. Somebody once said that Tubbataha is like Africa, you know? It’s unknown, you never know what to expect, all of a sudden — it can be a very boring dive for 30 minutes then all of a sudden you get to a point where there’s a lot of current and then you see everything all at once. I know I was so excited seeing a whale shark being tailed by five grey reef sharks only to find out that one of the divers in my group who was at the end taking pictures that past by a tiger shark. A tiger shark passed him by on his left side. He wasn’t even aware of it until it had gone past him. You get moments like that in Tubbataha all the time. [0:10:26.7] CM: Yes, I have to agree, I have had a couple of very close encounters with normally very shy eagle rays and the grey reef sharks are, they are very prevalent aren’t they? And they’re not that shy, they let you come pretty close before they lazily saunter off. With the other mega fauna, you just mentioned whale sharks, but manta rays are quite often seen there as well, right? [0:10:49.7] YM: Especially now I think they found several cleaning stations. They know where to look for them, although it’s still not a guarantee and, you know, like you said, it’s a dynamic place. Not this year but last year, we call it the year of the whale shark, there were just so many of them. I remember on my trip, I had 14 separate encounters with them for my one week trip. I’m not saying I saw 14 different whale, but I had 14 encounters. Considering I dove 20 times during that period, for me to have 14 encounters with them is quite unusual. [0:11:24.8] CM: That’s absolutely remarkable. I mean, that was just you or the boat pursuing the usual itinerary moving from site to site. It wasn’t going looking for them. [0:11:35.0] YM: Yes, exactly. At one point, the last one, I remember, we were all doing the airport, which is if you remember it’s quite shallow, it’s between 40 to 60 feet and we were already around 15 meters of water gassing off, we’re getting ready to go up and we were all looking at something and then the whale shark looked like it was like, “What are they looking at? Let me go see.” All of a sudden it was beside us looking at what we were looking at. Everybody went amuck when they saw the whale shark just hanging out beside us. So it was a great last dive for everybody. [0:12:10.7] CM: Fantastic. Yeah, that actually raises a good point about the topography of Tubbataha, because there’s lots of nice sort of top shallow reef, you know? Kind of ?at and then it just sort of literally falls off a cliff, doesn’t it? She says, “Yvette, what is there to brief about Tubbataha? Every dive is almost the same. You jump off the boat, you go on top of the reef and then you go off the wall, it’s an alcove.” But of course for me, especially for those who do have the privilege of going there several times, you have to remember that even the walls are different from each other. From their several times or here now for our listeners. If you go there, try to notice the differences between the walls from one dive site to the next. One dive site may be filled with yellow corals, the other site would be filled with pink sea fans, that sort of stuff. [0:13:30.6] CM: That’s right, and the sea fans is worth pointing out. Some of them are absolutely huge. I mean, bigger than a person, they’ve been there for years. [0:13:41.4] CM: I mean, that’s one of the most interesting things about the whole area is there’s — obviously it’s been there so long and so quite a lot of it still has been, thankfully, left untouched, undisturbed and has just been able to grow and grow and obviously grow upon the old corals that dies off and stuff like that. That usually will be found sort of kind of a little bit deeper rather than shallower, right? [0:14:01.2] YM: Correct. The deeper portions, they do hide the biggest fans. But in Koho, that place where unfortunately the US navy ship ran aground, it’s known aside from the white hanging soft corals on the walls, it’s the best place to see the giant refrigerator sized barrel sponges. If you see a giant barrel sponge bigger than a refrigerator, you know you’re in Tubbataha. [0:14:30.1] CM: Also great for photos. [0:14:34.1] CM: Yes, it doesn’t move either so that’s a bonus. We’ve talked a lot about the big stuff, which obviously I guess is what people want to come for, but how about the critters, the macro side of things. Have you spent much time sort of exploring that, because I know you love shooting wide angles, so do you like to go and dig around for the small stuff? [0:14:54.2] YM: Honestly, I know that my eye is really for wide angles so I did the next best thing and I sent Mike Bartik, I think you also know him. [0:15:03.8] CM: Yes, from [inaudible] right? [0:15:05.8] YM: Yes, he was a critter guy. So I sent him there with this specific instruction, “Write about the critters of the reef,” and he comes back and he’s like, he gives me all this pictures of the wide angle too. It’s just very hard to concentrate on the critters when you have so much of the big stuff going around, that’s my point. But I must say that, you know, because some of the guides are smart enough, they found — we do have them is what I’m saying. We found pigmy sea horses, but a lot of people who come to Tubbataha have seen pigmy sea horses before. So it’s not necessarily on their wish list when they go to Tubbataha. If you look at the wish list it’s all the big stuff, but they are there. We’ve seen the — we’ve got the beautiful pigmy sea horses but everybody’s got wide angle on so who’s seeing the pigmy sea horses? [0:16:01.8] CM: Okay. Because I didn’t think I’ve ever actually dived there. I might be wrong, but is Jessie Beazley Reef in the area. [0:16:11.2] YM: That was the next thing I was going to ask you to see. When we get a chance, we have been going now to Jessie Beazley because they’ve included it into the park system. Right now, if memory serves me right, it actually has the highest live coral cover of anywhere in the Philippines. We’re getting fields of intact foliose corals, table corals perched at the edge of the reefs and yes we still the hammer heads and the tiger sharks and the whale sharks there. So definitely you have to come over and everybody else. It’s done usually on the first or the last day of the trip. [0:16:49.9] CM: Right, it’s sort of just a couple of miles away from Tubbataha itself, right? [0:16:54.6] YM: It’s not a couple of miles. I think it’s one third of the way back to Puerta Princesa. [0:17:01.4] YM: It’s far off, but it is now part of the park system. [0:17:03.5] CM: Okay. When we dived together three or four years ago, we did like a 10 day trip. So we were at Tubbataha and then we went to another place. It began with C, with big long name. [0:17:22.1] YM: Cagayancillo in Palau. The one where I called you over to make sure that you saw the clown fish. [0:17:25.8] CM: That’s right, my nemesis, the clown fish. [0:17:28.4] CM: Do you still go there? Because I remember that was a pretty lovely area as well. [0:17:32.8] YM: I think this year because the boat, one of our boats, the new boat will probably be going back via Cebu to Palau, you’ll probably do that but usually we don’t anymore. However, having said that, it’s easy for us to especially if it’s a charter, we can do a special trip and combine both. Tubbataha, Cagayancillo and Tanusa. [0:17:54.0] CM: Okay, cool. That was the other thing, just moving off from Tubbataha, is that we were talking before about other areas of the Philippines that you’re involved in promoting for diving. Because obviously the Philippines’ still, while it has a burgeoning dive industry, there are still many areas that are frankly no one really knows about still on an international level. With the Dive Vasco, which area is that covering? [0:18:16.9] YM: Dive Vasco covers Tubbataha also, but we’re going to start moving to Cebu during the off season after this coming Tubbataha season in 2017. We’ll be offering short trips to Cabilao and to Oslob and for those who want, we can extend it all the way to Apo island and to the other Visayan Islands. It’s actually quite well known to a lot of other people but now that — and they have roads that have been servicing the area, but now that we have a bigger market coming in, I think it’s time to position our boats there also. [0:18:53.5] CM: Yea. So just to be clear, that we’ll basically be like a live aboard that would travel around the Visayas and go to all these different spots in a four day trip or something, right? [0:19:02.2] YM: Instead of going to a resort and spending several days there, you can hit all of the spots in the Visayas in one go. [0:19:09.1] CM: Awesome. 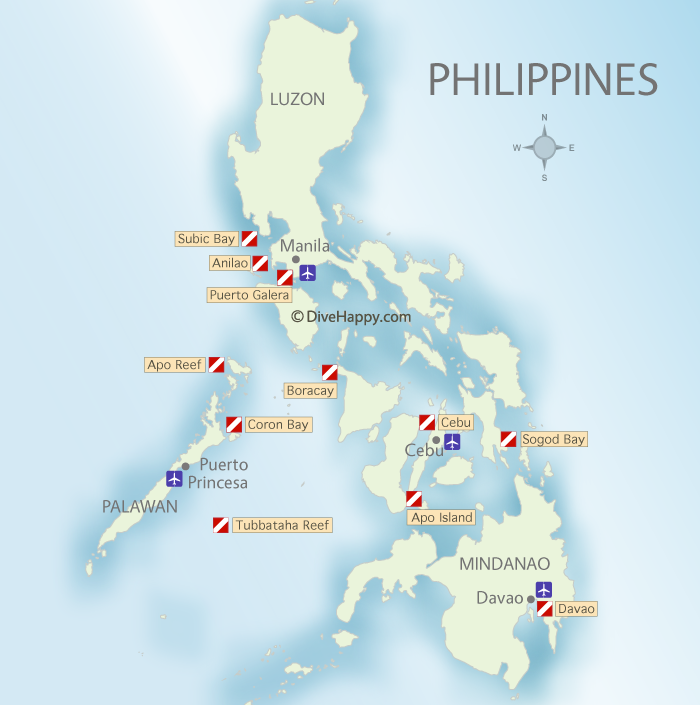 What is your general feeling, given that you’re at the heart of the Philippines dive industry, what is your general feeling about how — is it growing significantly? Are there a lot more foreigners coming or is it kind of just staying a similar kind of level from year to year? Maldives, what is the biggest game changer now is the Chinese market. Three to five years ago, they comprised maybe 10% of my market. Then two years ago it increased when this year, they covered 50% of my customer base and I think it’s the same for everybody else that I’ve spoken to. [0:19:57.5] YM: It’s just a matter of whether you want the Chinese visitors or not. Let’s be honest about this, a lot of people don’t like having the Chinese around because they say that they’re very destructive to the environment. My sentiments are, we can’t have this, “not in my backyard attitude”. We can’t stop them so we might as well do whatever we can to teach them to become responsible divers. Because for me, every divers and environmentalist. I mean, why did you take up diving in the first place? It’s to enjoy the sea like you do, right Chris? [0:20:30.1] CM: Yeah, I completely agree, yeah. [0:20:32.8] YM: So for them, I think for most of them, it’s the same way and even if I do get one bad egg in a group let’s say, the rest of the people in the group all get on the case of that one particular person. So it’s just a matter of teaching them and trying to get them into the community of divers to prevent our underwater environment. So that’s what we were doing. Tubbataha is taking concrete and very active steps to do this. You know how they have in the Philippine airlines, they have this movie at the beginning of the trip, talking about the safety features and the do’s and don’ts. Tubbataha management office is commissioning a film right now and it will be in several languages, including Chinese, that must be seen by all the guests. [0:21:14.6] CM: That’s great. I think as well, I mean in Thailand as well, there’s kind of quite a lot of back lash against Chinese tourists. I’ve seen the same in Bali, and it strikes you a lot of the time. Fair enough, there are some tourist badly behave but a lot of time, it’s actually poor management on the behalf of the people who are owning the resorts and the areas themselves. They don’t seem to be prepared for the influx of new visitors or how to look after them. If you direct people in the right things to do, they would generally follow the rules. But you just have to be explicit about what they are. [0:21:48.7] YM: Exactly what you just said, it’s not the people, it’s poor management. The responsibility also lies in the management of the people. We take that very seriously and we’re going to do something proactive about it. We can’t just assume that, “Oh, when they graduate with their sea card, they should know already.” No, they don’t know. They don’t know sometimes that they’re not supposed to be touching the turtles because especially if you go to Sipadan, you see the turtle shell are very dirty and you have to fight this urge to scrub it away with your glove. You get the other extreme wherein you have divers, and not only Chinese divers but any diver. I’ve had Russians, I’ve had Americans, wanting to hold on to the turtle riding it. Because when they were younger, that’s what they saw people doing on TV. [0:22:36.4] CM: Sure, I think as ever in whatever context, education is the most important thing isn’t it? And like you say, the only way to do it is to actually get out there and do it rather than sort of try to be stand off-ish and say, “I don’t want to deal with it.” Because the Chinese are effectively, to my mind, seems what would save the dive industry in terms of bringing new blood, younger people as well. I mean, no one really talks about that but most of the dive people are quite old these days. [0:23:08.0] YM: You know who brought that to my attention was a friend of mine from Japan. He said to me that with the advent of all the digital gain, Android and all that stuff, the digital gadgets because it’s harder for them to bring in new people to come into the dive shop to learn how to dive. They can do it vicariously, watching 3D TV with all these reality glasses on. So thank god the Chinese are there. There are still a lot of people who now enter the industry, and it’s serious and big enough for probably to have a separate program for them, as far as business is concerned. [0:23:47.6] CM: Wow, that’s great. Obviously everything changes and I think broadly it’s a positive and like you say, every diver is an environmentalist whether they know it or not. I think once people really fall in love with the ocean then they are going to become somebody who wants to protect it. It seems to be a winning situation, it’s just a learning curve to go through, that’s all. [0:24:08.9] YM: That’s right. It’s not such a hard learning curve, you know? Just watch. Watch what’s going on, just don’t touch anything. Make sure your fins are not hitting, or stirring up the sand and that sort of stuff. [0:24:22.6] CM: Cool. All right Yvette, thank you so much for talking to me about Tubbataha and well, the rest of the Philippines. I hope we can go diving again soon. [0:24:32.7] YM: Soon, let’s set the date for this coming season then, Chris. After I have a bag of chocolates from you. Thank you for having me on your show.